Did Harry Potter ever intentionally kill? I've read and read the books but I can't seem to find any place where Harry kills another person. My question is does he? And where? And who? Technically he never does. 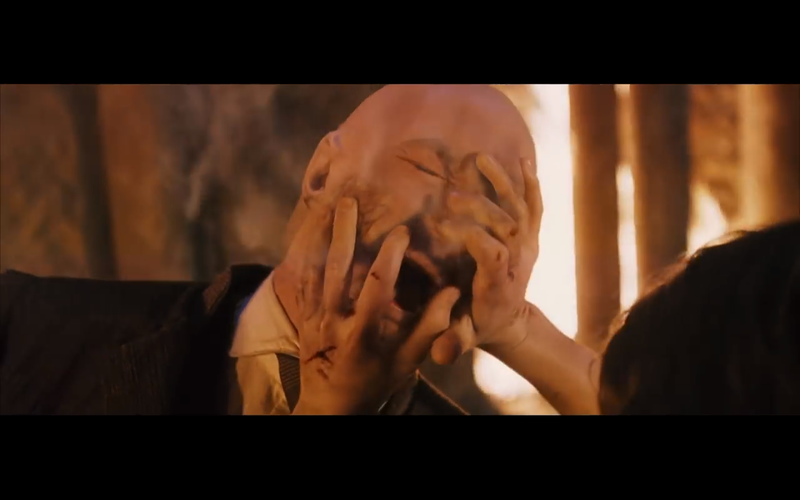 Voldemort kills himself. Although knowing him, he probably sees the fact that he didn't offer himself up sooner during the Battle of Hogwarts, as making him at least partially responsible for the deaths that happened. He keeps his hands on Quirrel's face to save his own life, but passes out from the pain of it. Quirrel would have had the chance of pushing away, but then Voldy would have done him in. It depends on what you mean by "intentionally kill." Did Harry ever cast the Killing Curse, or kill someone with a spell? The answer to this is unambiguously no. Did Harry ever act with the intent to kill someone? Yes. Harry spent the better part of a year destroying Horcruxes with the explicit understanding that it would allow him to kill Voldemort. Harry never really seemed to harbor any delusions that Lord Voldemort could be bargained with or thrown in prison. It was always going to end in Voldemort's death, or Harry's. In the end, Voldemort killed Voldemort, not Harry, but Harry entered the battle with the understanding that Voldemort would end up dead. That's why he told Voldemort to "try for some remorse." He had seen what awaited Voldemort's mutilated soul in the afterlife, and realized this was Tom Riddle's last chance to undo years of damage. Obviously, regardless of whether or not he "intentionally killed" Voldemort, Harry was acting in defense of himself and his friends. He certainly wasn't a murderer by any definition. Did Harry ever cast a spell he knew would very likely kill someone? Yes. During the Battle of the Seven Potters, Harry casts several Stunning Spells and Impediment Jinxes aimed at wizards on broomsticks thousands of feet above the ground. The text always makes sure to say that other wizards swoop in to collect the Death Eaters knocked off their brooms. Later, when explaining why he Disarmed Stan Shunpike instead of casting a Stunning Spell, Harry straightforwardly says that Stunning him would have been the same as killing him. That shows that he was pretty aware when fighting the Death Eaters that he was casting spells that were very likely to kill them. Another example is that during his duel with Snape at the end of Half-Blood Prince, Harry casts Sectumsempra, a curse with the potential to kill unless the victim receives prompt attention from someone with advanced knowledge of the Dark Arts. I don't doubt that if Harry's curse had connected, Snape would be dead. In the end, no, Harry never intentionally killed anyone. But only because of circumstances beyond his control. Harry kills Voldemort. By systematically destroying his horcruxes, and then rebounding a killing curse into Voldemort. The biggest point to this question is intent, Harry showed clear intent that he wanted Voldemort to be able to be killed. After accomplishing this he then put himself and Voldemort in a situation in where Voldemort would be able to be killed, and lo and behold Voldemort dies as intended. We can also assume Rowling wanted Harry to kill Voldemort as the prophecy even says that one will kill the other. She just had Harry kill him in a very nice way, not compromising Harry's ideals. The definition of at the hands of is an event or consequence that happens under the control of a certain person or is caused by a certain person. An example of at the hands of is when a murderer kills a victim. The victim would be said to have died at the hands ofthe [sic] murderer. If the books are the only accepted source of answers, then I agree with BMWurm's answer. First of all, it is still true that Harry first attempts to fend off Quirrell in self defense. But when Quirrell is ordered to get the stone by Voldemort, he no longer tries to attack Harry, but rather go straight for the stone. 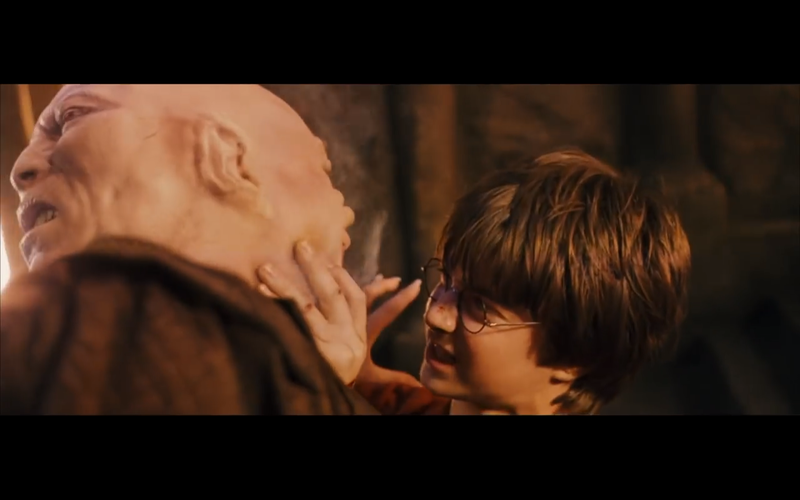 Harry, on the other hand, directly attacks Voldemort by placing his hands on his face. it is clear that Quirrell is not attacking Harry because you can see his hand reaching for the stone, not for Harry's body in any way. To say that Harry didn't kill him, but rather his mother's protection did, is in my opinion a weak counter argument because Harry used the protection (though not known by him what it was at the time) as a weapon to fend off Quirrell. To be stated again, this answer is obviously a movie only answer because the corresponding scene in the book does not play out the same way. Why hasn't anyone tried to kill Harry Potter? Did Harry Potter ever wear contacts? Reading order for Harry Potter auxiliary books? When did Voldemort find out that Harry was hunting Horcruxes? Did JK Rowling ever use Harry Potter's vision when he first learned about splinching?